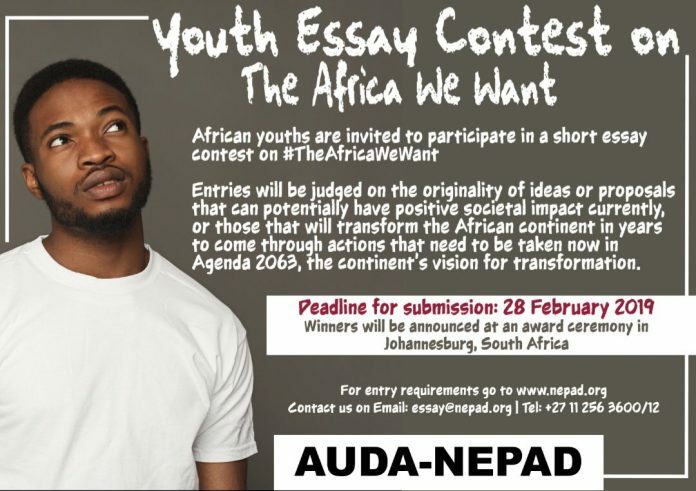 Submit entries for the AUDA/NEPAD Youth Essay Contest 2019. In an effort to promote African youth’s active participation in the continent’s development, the African Union Development Agency/NEPAD is running a short essay contest, targeting young African people and its diaspora in proposing concrete pathways through which Agenda 2063, the continent’s framework for transformation, can be fast-tracked. The contest aims to provide the space through which youths can express their views freely on “The Africa We Want” by articulating their aspirations and ideals for shaping the future of the continent. The short essay subject is “The Africa We Want”. Participants are invited to submit their innovative ideas through a short essay format – the ideas or proposals should be those that can potentially have positive societal impact currently, or those that will transform the African continent in years to come through action/s that need to be taken now. All youths (between the ages of 15 and 35) and especially girls, women and people living with disabilities are strongly encouraged to participate. Essays can be written in any of the African Union (AU) official languages namely: Swahili, English, French, Arabic and Portuguese. If sending by POST: Address the mail to: NEPAD Agency, 230, 15th Road Randjespark, Midrand, Johannesburg, South Africa. If posting your entry, please be sure to paperclip all of your documents together, including the essay. Note: Winners will be announced in April 2019 at the ‘Championing of Agenda 2063 for #TheAfricaWeWant’ advocacy event in Johannesburg, South Africa. They urge all entrants residing outside South Africa to therefore have their passports ready, as the top five winners will be invited to the prize-giving ceremony in Johannesburg. The winners will all be notified prior to the event by email or phone number provided in the submission. For more information, visit AUDA/NEPAD Youth Essay Contest.